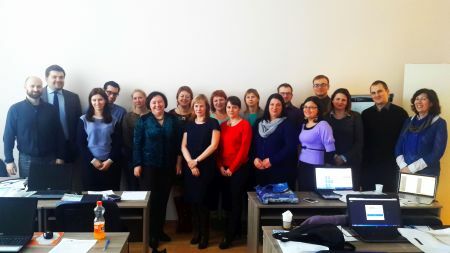 On Wednesday, March 16th took place a NAV Academy seminar “Perfect hotel business automation” which was organized by Mindcore and Trainer-IT training center. CEOs, chief financial officer, chief accountants, heads of IT-departments – more than 20 representatives from leading hotels have dedicated their day to solutions designed to improve the efficiency of their work. Speakers Olga Matrosova (Mindcore) and Alexander Ermakov (Awara IT solutions) demonstrated how the various programs integration with Microsoft Dynamics NAV is carried out at hotels, revealed the intricacies of financial accounting, told how to track the business situation and to receive analytics in a convenient way by means of Power BI service. Great impression on the audience has made the Microsoft Dynamics NAV 2016 – how the updated functionality can simplify and make more convenient user experience and work of the hotel in general. During presentations participants shared the problems that they face every day in their work and asked a lot of questions. Notice that a lively atmosphere is inherent to all activities of the NAV Academy series. But this time common tasks bonded participants to such extent that they decided to continue the dialogue beyond the framework of the seminar. Another proof that common interests can bond, became a partnership between Mindcore company and Awara IT solutions within the framework of NAV Academy. An interesting and useful presentation made by Awara IT solutions Managing Partner allowed to reveal in its fullness the theme of hotel business automation. This indicates that in quest of solutions to the complex problems, the partnership may be more efficient than the competition. “At the Russian market such alliances are extremely rare – noticed Alexander Baikov, Mindcore Director of Partnerships – but we were able to work together in order to show the wide range of solutions that are unique to the hotel business and to demonstrate the unity of competing companies. The seminar “Perfect hotel business automation” probably was one of the most successful in the NAV Academy series “.